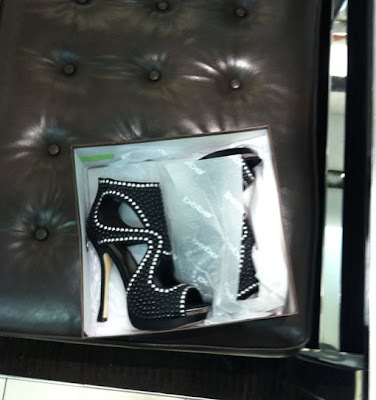 I never try them on, but I always spend lots of time rubbernecking in the 34th Street bebe shoe section. Come on, faux pearl encrusted with black blingy somethings? Who isn't mesmerized by the above? The selection these days is toning down the 5-inch+ heel height of the past few years, but don't panic, bebe will always provide you with shoes that make your legs look fabulous as you teeter down the street in sky-high platforms. Love the polka dots and the weave wedges. Where would we be without our heels? I'm selling a pair of Size 8 Chantal shoes on Ebay. Username:ReeRee_03. Thanks!